Gah! Is it just me or is this week dragging ON forever? Anyway, for those music lovers who are looking for something to do this weekend, the We Are Cardiff flag will be flying (and by that I mean I’ll be drunk and draped over the speakers) at Chapter Arts Centre on Friday and Saturday for From Now On festival. 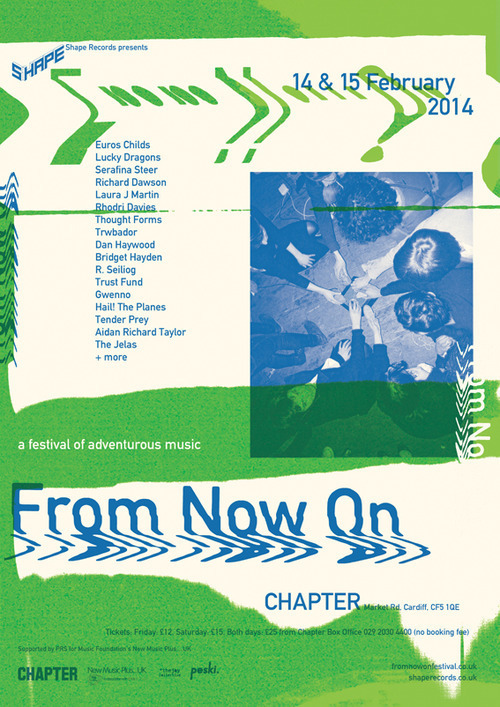 It’s been put together by Mark of Shape Records, and is a new festival of adventurous and experimental music. I’ve been trying to get Mark to do a We Are Cardiff for about four years now (unsuccessfully, he keeps running away from me every time I mention it), but I’ve managed to squeeze a mini interview out of him, which you’ll be treated to next week, along with photos from the event.